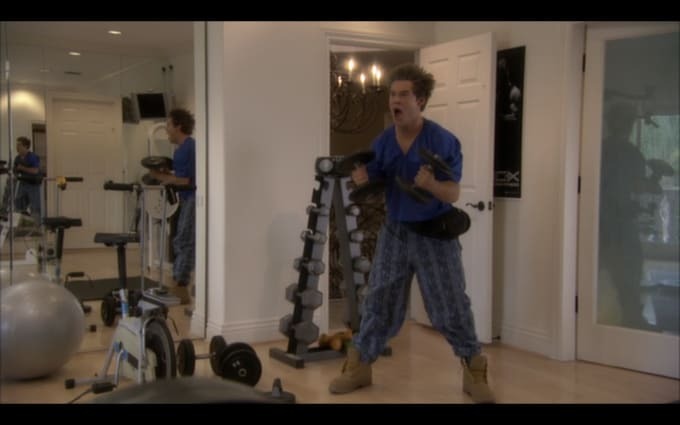 Episode: "Muscle I'd Like To Flex"
Adam: I wanted to look like I Tokyo Drifted myself to a Gold’s Gym. I wanted to bring that retro vibe into today’s era with pants, boots, and a mesh shirt. So far I’ve seen no one wear any of those things, so I’m not sure how much I’ve affected society with them. Complex: Well we’ve seen printed pants for men in some recent fashion collections. We’re sure that’s directly because of your influence. Adam: Yeah, I 100% agree with you.